Community Services :Upper Bay Counseling and Support Services, Inc.
LOGIC prepares children to live with the consequences of their choices. Parenting the Love & Logic Way is a 12-hour course based on the nationally recognized parenting theory that children learn best through natural consequences. When parents and children share control, children are given opportunities to develop good decision making skills. A certificate is awarded after the 12 class hours have been successfully completed. This program, known as Parenting the Love & Logic Way, is based on a philosophy founded by Jim Fay and Foster W. Cline, M.D., and on their combined experience of over 75 years working with, and raising, kids. Many parents want their kids to be well prepared for life, and they know this means kids will make mistakes and must be held accountable for those mistakes. But these parents often fail to hold the kids accountable for poor decisions because they are afraid the kids will see their parents as being mean. The result is they often excuse bad behavior, finding it easier to hold others, including themselves, accountable for their children’s irresponsibility. Parenting with Love & Logic teaches us that we should “lock in our empathy, love, and understanding” prior to telling kids what the consequences of their actions will be. The parenting course “Becoming a Love and Logic Parent” teaches parents how to hold their kids accountable in this special way. Parenting the Love & Logic Way is held at several different locations in the county – evenings, and weekends. The program is $150/per person or $ 200/per couple and is not covered by any insurance. For more information, contact Susan Lebowitz in the Office of Organizational Development at 410-996-3401 ext. 1201. Or click for a printable version of the Love and Logic brochure that also shows dates and times of upcoming classes. 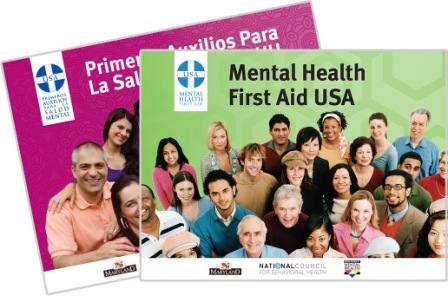 Course Length: The Mental Health First Aid course is 8 hours long. In your community, it may be offered all in one day or over two or four shorter sessions. Activities: You learn by getting involved with the material and relating what you learn to real-life applications. Discussion topics, exercises, and other activities keep you engaged in the course and give you an opportunity to practice helping skills. Environment: One or two certified instructors lead each course and follow a national curriculum and teaching standards, while emphasizing hope for recovery. Classes usually consist of 30 people or less are offered in a respectful, comfortable environment. Adult: The adult Mental Health First Aid course is appropriate for anyone age 16 and older who wants to learn how to help a person who may be experiencing a mental health related crisis or problem. The adult course is available in both English and Spanish. Youth: The youth Mental Health First Aid course is primarily intended for adults to learn how to help young people experiencing mental health challenges or crises. It reviews the unique risk factors and warning signs of mental health problems in adolescents ages 12-18 and emphasizes the importance of early intervention. The Anger Management Program at Upper Bay Counseling will not only show you where your anger comes from, but also how to control it. Anger management is an educational process. With the right tools, people can learn to manage their anger in any situation. You can learn this process of managing your anger. That is the primary goal of this program, teaching people to deal with their anger. The goal is not to eliminate anger as anger is a natural and healthy emotion. After you acknowledge your anger, you can learn to reduce the emotional and physiological arousal that it causes and learn to control its effects on people around you and the environment. This class is designed to help participants acquire the skills needed to manage their anger using a variety of techniques, including work-book exercises and physical techniques, which will be combined with classroom discussions that will help give you a better control and understanding of your anger response. The anger management class is divided into six sessions lasting approximately two hours each. Classes are held at the Cecil County Circuit House at 129 E. Main Street, Elkton, MD 21921. The classes are held on Tuesdays from 4 to 6 p.m. and all facilitators are employed by Upper Bay Counseling, licensed by the State of Maryland and have experience with anger management programs. This program is offered for those who have been court ordered to take anger management classes to satisfy the court as well as other individuals who have been encouraged to participate in an anger management program. Each participant must complete an initial assessment and all six sessions at $60 each for a total of $420. Payment in full of $360 (a savings of $60) can be made at the time of the assessment or the option to make weekly payments of $60 is also available. The program is not covered by any insurance plan. For more information, contact the Office of Organizational Development at 410-996-3401 ext. 1243. Or click for a printable version of the Anger Management brochure that also shows dates and times of upcoming classes. Our Child and Adolescent Care Coordination Program provides Mental Health Case Management to children and youth under 18 years old who have serious mental health issues or co-occurring issues and who meet eligibility requirements. This program focuses on the strengths of the child and family and builds upon those strengths to meet the goals of the care plan. This service provides support for the child and family through creating a Child and Family Care Team to help and support the client and family in reaching and maintaining the goals of their care plan. For an article about this program with additional information, see our blog post. Eligibility is determined at the time of referral. All participants must have a current mental health diagnosis. Referrals may be made by community partners or family members. For an Open Letter from UBCSS’s CEO concerning Mental Health Advocacy, see this page: Make a Difference.